Since the 1990s, suicide rates among elementary-age black children have nearly doubled, while suicide rates among white children have fallen, according to a new study published in the journal JAMA Pediatrics. 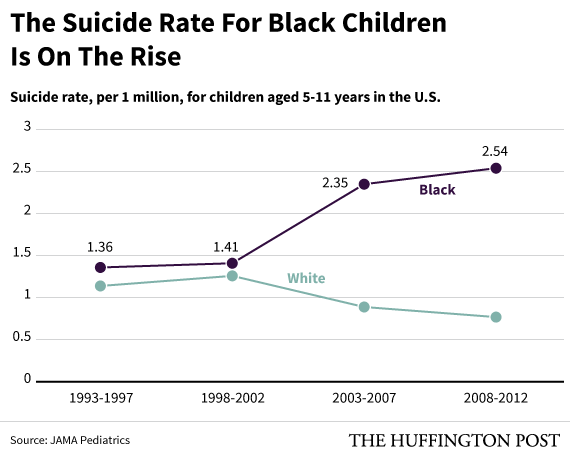 The study examined statistics for children between the ages of 5 and 11 from 1993 to 2012, and found that while the overall suicide rate among this age group remained stable, the rate increased significantly among black children (from 1.36 to 2.54 per 1 million children), and decreased significantly among white children (from 1.14 to 0.77 per 1 million children), during the same period. While the suicide rates among elementary-age children in general are relatively low compared to the number of suicides committed by adolescents and adults, these statistics are significant because they explore a little-studied demographic and because they show the reversal of a trend. "Most of what we know is about depression in adult samples," Dr. Shervin Assari, a research investigator at the University of Michigan Department of Psychiatry who was not involved in the new study, told The Huffington Post. "The very important contribution of this paper is not because of its impact or the size of the problem. It is about trends." Historically, black individuals in the United States had lower suicide rates than white individuals across all age groups, and suicide was largely considered a white problem. "It’s a very interesting but unfortunate trend, which suggests that’s not the case anymore," Assari said. "To our knowledge, this is the first national study to report higher suicide rates in U.S. black individuals compared with white individuals," Jeffrey Bridge, the lead author of the study and an epidemiologist at the Research Institute at Nationwide Children’s Hospital in Columbus, Ohio, told HuffPost. It's a particularly troubling finding since suicide is one of the only negative health outcomes that has not previously been associated with the black community. Other negative health outcomes, such as higher breast cancer, childhood obesity and infant mortality rates, have long been associated with being black in America. Black people have often fared poorly in their interactions with the mental health care system. For example, they are nearly half as likely as whites to receive treatment for diagnosed mental health disorders of comparable severity. When black patients do receive treatment, it is far more likely to occur in an emergency room or psychiatric hospital than it is for whites, and less likely to be in the calmer office-based setting, where longer-term treatment can take place. It's difficult to say for certain why more black children are committing suicide, but researchers identified exposure to violence and traumatic stress among black children, as well as aggressive school discipline and a higher likelihood of early onset puberty, as possible risk factors. "Studies to determine whether changes in suicide rates in black and white children corresponded to periods of change in risk factors for child suicide are important next steps," Bridge said. The trends in the study were driven by boys. Across all age groups, women are less likely to die by suicide, even though suicide attempts are three times higher among women than men. The study also pointed pointed to the reversal of a second trend. While the rate of suicides by firearm decreased among white boys, the rate among black boys remained flat. One possible explanation for this disparity could be that gun safety education isn't reaching black communities as effectively as white communities, Dr. Christine Moutier, chief medical officer for the American Foundation for Suicide Prevention, told The New York Times. Suicides by hanging, by far the most common suicide method in the study, nearly tripled among black boys, but remained flat among white boys. "The nation needs to fund more suicide studies on blacks and monitor or provide better care for psychiatric disorders of black youth," Assari said. "This age group is mostly under the influence of the family. We know family-based interventions, which work. We know suicide prevention programs, which work. We know what works. We just need to implement it."